De informatie hieronder geeft een indruk van de kosten van Anti Retrovirale Middelen voor patënten uit de Upper West als zij behandeld worden in de IHCC kliniek in Accra. De weergegeven kosten zijn in Cedis. 10.000 Cedis is circa 1 Euro. WAAF Accra - Upper West Region gateway to A.R.T. 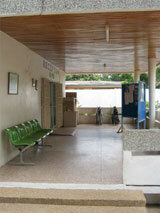 A few places in Ghana provide Anti Retroviral Treatment (A.R.T.) for people who are living with HIV/AIDS. These places are located mostly in the south of Ghana and this makes it very difficult for people in the Northern Regions to access A.R.T. Information on accessing A.R.T. for people for the Upper West Region is listed below. IHCC is a community clinic with a lot of experience on HIV/AIDS. They have a multidisciplinary team for the various problems faced by people living with HIV, an in-patient department and a pharmacy. They collaborate with the Korle Bu Hospital in Accra for A.R.T. IHCC is willing to help people from the Northern Regions by providing space for lodging. Lodging will be free for people who are not clinically ill and who do not need any specific medical and nursing care. The clinic doesnt provide meals. And the service depends on availability. Being HIV positive does not mean that you can start A.R.T. immediately. The decision will be based on the outcome of several laboratory tests to investigate your clinical condition (CD4 count test / kidney and liver function test). Also your social and financial situation plays an important role for the doctor to be sure that you are capable to be on A.R.T. for the rest of your life and that you can eat good food. The few months after starting A.R.T., you need to stay in Accra for continuos medical observation. This will be a period of at least three months. You can go home after this period when everything goes on well. Every two months, you have to come back to Accra for provision of drugs and medical check-up till the A.R.T. is initiated in your region (expected year for A.R.T. in UWR 2007-2009). This information is given for you to get a general idea, but may change over time and depends on individuals condition.